Property Location With a stay at The Blackstone, Autograph Collection in Chicago (South Loop), you'll be minutes from Columbia College Chicago and Grant Park. 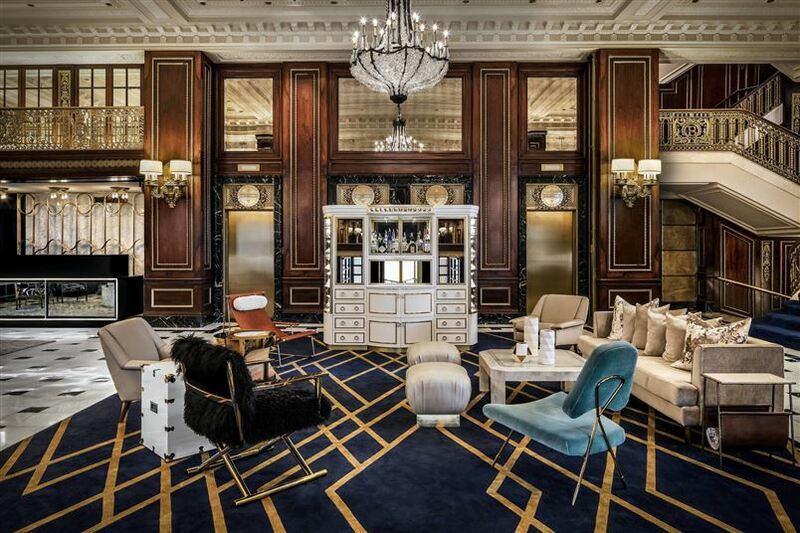 This 4-star hotel is close to Art Institute of Chicago and Millennium Park. Rooms Make yourself at home in one of the 332 air-conditioned rooms featuring refrigerators and Smart televisions. 50-inch flat-screen televisions with premium TV channels provide entertainment, with wired and wireless Internet access available for a surcharge. Bathrooms have designer toiletries and hair dryers. Conveniences include safes and desks, and housekeeping is provided daily. Amenities Take advantage of recreation opportunities such as a fitness center, or other amenities including concierge services and gift shops/newsstands. Additional features at this hotel include wedding services and a fireplace in the lobby. Dining Grab a bite to eat at the hotel's restaurant, which features a bar, or stay in and take advantage of room service (during limited hours). Quench your thirst with your favorite drink at a bar/lounge. Breakfast is available for a fee. Business, Other Amenities Featured amenities include a computer station, express check-in, and express check-out. Planning an event in Chicago? This hotel has 11,396 square feet (1 square meters) of space consisting of conference space and meeting rooms. Special Event Rate - King Bed. 45 inch TV, Hulu + Netflix connectivity, Mini-Fridge, Iron/Iron-board,. No breakfast included. Additional fees: Parking Valet Only - $75 . You must be at least 18 years old to check into room. This Rate is based on 2 person(s) in room over age 18. Special Event Rate - 2 Queen Beds. 45 inch TV, Hulu + Netflix connectivity, Mini-Fridge, Iron/Iron-board,. No breakfast included. Additional fees: Parking Valet Only - $75 . You must be at least 18 years old to check into room. This Rate is based on 2 person(s) in room over age 18. Special Rate - Standard Room - Special Rate This special rate is offered for a limited time! Don't Delay, Book Today! This rate is Non-Refundable. Best Available - QUALIFYING MEMBER RATE (AAA): AAA Hot Deals, Guest Room, 1 Queen. Best Available - QUALIFYING MEMBER RATE (AAA): AAA Rate, AAA Membership Card Required, Guest. Room, 1 Queen. Best Available - QUALIFYING MEMBER RATE (AAA): AAA Hot Deals, Guest Room, 1 King, Lake View. Best Available - QUALIFYING MEMBER RATE (AAA): AAA Rate, AAA Membership Card Required, Guest. Room, 1 King, Lake View. With a stay at The Blackstone, Autograph Collection in Chicago (South Loop), you'll be minutes from Columbia College Chicago and Grant Park. This 4-star hotel is close to Art Institute of Chicago and Millennium Park. Make yourself at home in one of the 332 air-conditioned rooms featuring refrigerators and Smart televisions. 50-inch flat-screen televisions with premium TV channels provide entertainment, with wired and wireless Internet access available for a surcharge. Bathrooms have designer toiletries and hair dryers. Conveniences include safes and desks, and housekeeping is provided daily. Take advantage of recreation opportunities such as a fitness center, or other amenities including concierge services and gift shops/newsstands. Additional features at this hotel include wedding services and a fireplace in the lobby. Featured amenities include a computer station, express check-in, and express check-out. Planning an event in Chicago? This hotel has 11,396 square feet (1 square meters) of space consisting of conference space and meeting rooms.